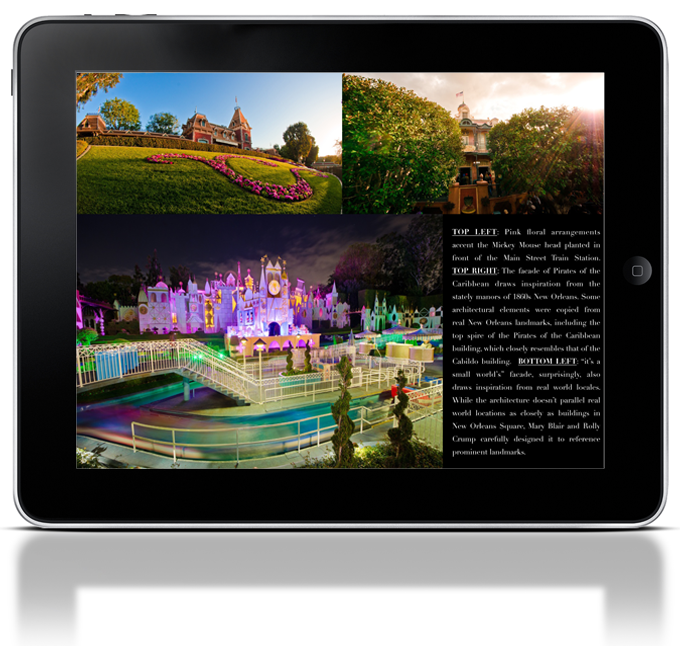 Disney Babies Blog: Disneyland E-Book! I'm sure that everyone reading this has heard about "One More Disney Day" - on February 29th, 2012, when both Disneyland and Walt Disney World's Magic Kingdom opened their gates for 24 hours. People stood in line prior to the 6 a.m. opening to receive mouse ears, buy shirts, and be apart of the magical day (sounds exhausting!). 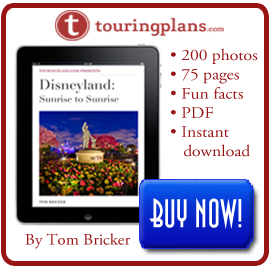 Tom Bricker, photographer and author for Touring Plans.com had another idea - he decided to show Disneyland in all it's glory. 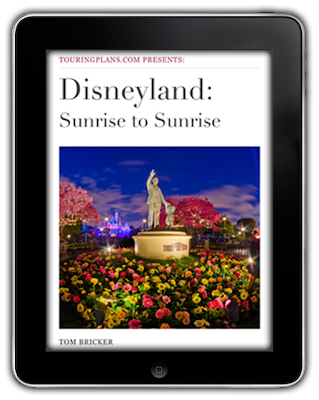 In his new photobook ebook, Disneyland: Sunrise to Sunrise, Bricker shares over 200 stunning photographs, viewing the park for literally 24 hours. It's not often regular guests will see the Disneyland resort at sunrise, but now we can see what it looks like! As I flipped through it (I have an Android based tablet which it showed beautifully on), I wished I could have a print copy for my coffee table. Luckily, I don't actually have a coffee table (removed because of a clutzy toddler...), so carrying this around with me is even more fun. As I haven't actually been to Disneyland yet, this books serves as a guidebook - things to look forward to, places and attractions to see. 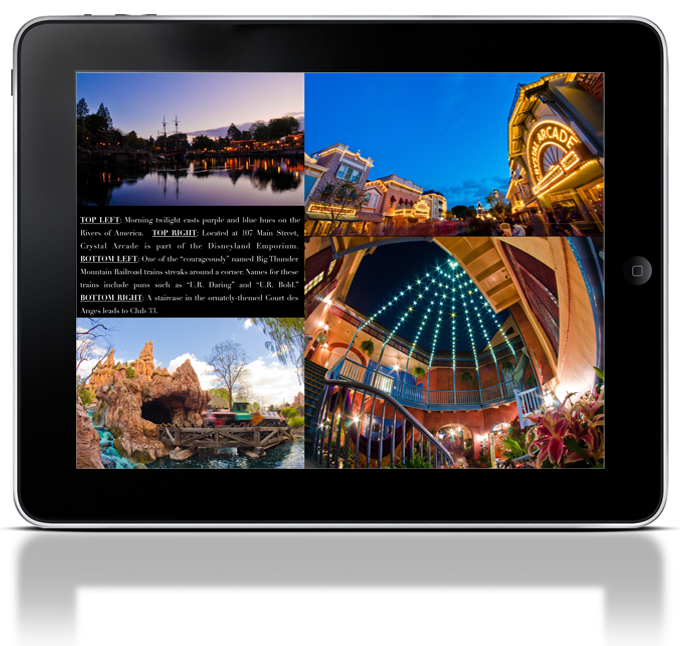 It's visually stunning! Even my husband, who enjoys WDW but not nearly on the same level as I do, kept looking over to see and say "ooh, what's that?" I had originally expected it to be in order from start to finish, which it wasn't. I found that odd - but, then you would be seeing pictures in the same lighting the whole way, and having it more mixed up gave it more visual interest. As you can see, Tom shares the time of day and the descriptions of attractions, for those of us not as familiar with the park. These photographs are beautiful and I love that this book is now available for purchase! This beautiful book is only $8, with the code SUNRISE2012, I get to offer you an extra 25% off! $6 - I spend that much at Starbucks a week! Not bad at all!